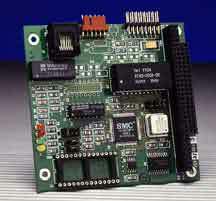 Ampro Computers, Inc.ule/Ethernet-II network interface module offers connectivity to the Ethernet local area network for PC/104-based embedded systems. The module implements the Carrier Sense, Multiple Access/Collision Detect node access protocol defined by the IEE802.3 Ethernet standard and operates at a data rate of 10 megabits per second. The controller provides a socket for a standard "remote boot" Eprom which can be used to boot the embedded system directly from the network. Two versions support all standard Ethernet media: one version offers a thin coax interface; the other connects directly to twisted pair media. The module complies with the 16-bit PC/104 form-factor specification.